Now that you’ve made the decision to migrate, where do you start? What does success mean? How do you ensure you don’t regress in performance? There is an old adage in carpentry that you should measure a board twice before you make a cut so you can limit the need to make a second cut correcting a mistake. This same principle applies to migrating your workloads to the cloud; if you’re not measuring the state of an application before and after a workload moves then you are likely to end up wasting precious time and effort. At that moment of truth when the workload arrives on AWS, seeing an application running in AWS isn’t enough. You need to know the application is stable, customer experience is at least consistent, and infrastructure consumption is acceptable. Enter the New Relic Digital Intelligence Platform, a simple, low-impact and powerful set of tools to baseline, compare, and validate your application ecosystem both on-premises as well as in AWS. 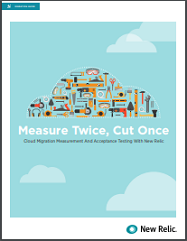 This simple guide will show you how to get quantifiable measures of success for your migration, ensure that your migration goes smoother when things do go wrong, and enable ongoing quality in your applications long after they’ve been successfully migrated to AWS. • Acceptance criteria: The concept and requirements. • The tools: What New Relic is and how to quickly get it set up on your systems. • Basic baselines and acceptance criteria: How to get immediate “black-box” baselines of your systems to answer the most important questions about your migration in minutes. • Granular baselines and acceptance criteria: How to leverage the full suite of New Relic’s Digital Intelligence Platform to get granular insights about how your applications perform at every tier and to understand all the requisite dependencies that need to be considered as part of your migration. • Post-migration optimization: How to continue to benefit from New Relic’s Digital Intelligence Platform after your successful migration, guaranteeing that your environments are never again susceptible to performance degradation without you being aware.